Time: maintain these conditions for as long as possible! Breakeven energy occurs If particles are confined in the plasma for longer than a couple of seconds. Fusion releases an enormous amount of energy throughout the universe, but the challenge is to create conditions similar to those in a star here on an earthly scale. 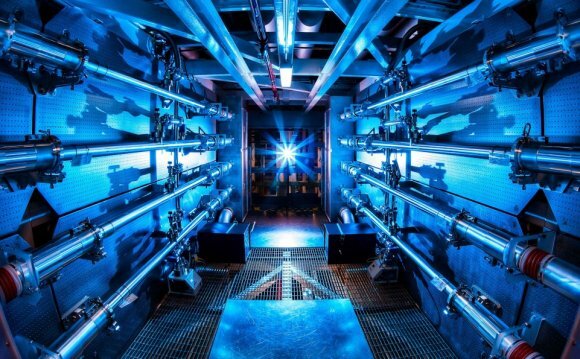 Fuel: A fusion power plant will choose only one of the many processes going on in the sun; it turns out that the most suitable reaction for an earth-bound fusion is between two isotopes of hydrogen, deuterium and tritium. Deuterium is normal hydrogen (a proton) with an added neutron, and tritium is hydrogen with two added neutrons. When these two nuclei combine, a neutron gets shot out at high speed. This hot neutron can then be captured, and its energy used just as in a conventional powerplant, e.g. to heat water to turn a turbine. The other product of the reaction is a helium nucleus (two protons and two neutrons), which ends up with about one quarter of the energy that the neutron carries. Because the helium nuclei are charged they cannot escape the magnetic field that confines the plasma, unlike the neutrons. Temperature: Deuterium-tritium fusion might be the most efficient reaction, but it still requires temperatures in excess of 100 million degrees. To achieve these remarkable temperatures, four separate heating systems are in use on JET, each capable of delivering well over a million watts of power to the fuel. Together they generate and sustain plasma that is easily hot enough for the high energy collisions required for fusion to occur. Density: The constituents of a 100 million-degree plasma are moving about really fast, and, if left alone would soon be so far apart as to render collisions extremely unlikely. To keep the density of the plasma high enough to ensure collisions do actually occur, the plasma vessel is surrounded by huge electromagnets. These create magnetic fields 10, 000 times stronger than the Earth’s magnetic field and confine the plasma to perpetually circulating within the ring-shaped vessel. However if the plasma gets too dense then collisions of a different kind – between nuclei and electrons – begin to create large amounts of radiation. This radiation, called bremsstrahlung, saps energy from the plasma and prevents fusion from occurring – the optimum density value is around one millionth of the atmosphere. Time: Eighty percent of the fusion energy is carried away by the neutrons, but the 20% carried by the helium nuclei remains in the plasma. The newly formed helium ricochets around the vessel colliding with unburnt fuel nuclei, heating them up, thereby reducing the need for the external heating systems. However it takes time for this to happen – depending on the density and temperature of the plasma. Plasma physicists combine these three parameters – temperature, density and time – by multiplying them together to form what is known as the fusion product (or triple product). At a certain value of the fusion product, called ignition, the reaction becomes self-sustaining: the heat generated by the reaction is enough to keep the plasma hot and so the external heating systems can be turned off. In practice, however, reactors would not be run this hot. Even below the ignition conditions the energy carried by the neutrons provides output well above break-even, but the added control resulting from having a plasma that can be easily turned off is very advantageous. The plasma in the sun is only 15 million degrees Celsius, but on earth, 10 times that value is required to make fusion happen. Fusion is possible in the centre of the at lower temperatures, because plasma pressure inside the sun is much higher than on earth. Moreover, the sun can sustain fusion at a lower temperature, simply because it is so big. At the sun’s temperature, only a very small percentage of the nuclei are moving fast enough to fuse, but that still amounts to enough particles fusing to keep the sun hot. A terrestrial fusion reactor, being smaller than the sun, has less particles, and therefore needs a higher mean particle speed, (i.e. temperature) to get the same amount of fusion.